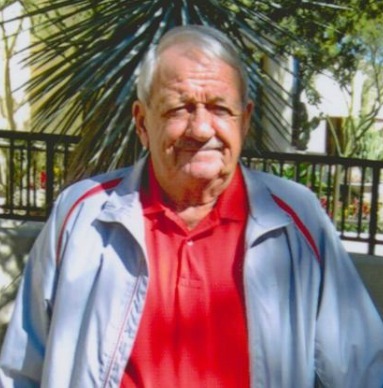 Howard, known by nickname, “Pete”, 81, departed from us on Tuesday, May 22 at 10:01 PM. His emphysema had advanced quickly and his heart just stopped. He was born in Cincinnati, Ohio; lived in Dayton, Springboro, Lebanon, Ohio and moved to Arizona in 2000. He was always a hard worker, and did not sit still for long. After closing and retiring 12-31-1993 from his and Ginger’s (wife) electronics business, he continued to work part time jobs at various Golf Courses and lastly at Security in Sun Lakes. He loved life and people. He was always happy with lots of laughs and no complaints. People loved him for his outgoing, upbeat lovable personality, caring ways, kindness, and sense of humor. He loved cars, flowers, rings, watches, shopping, and lottery tickets hoping for a win. In his early years he enjoyed golf with his friends. He had (41) beautiful years with surviving wife, Ginger, who he always treated like a queen. They had many fun and memorable trips to various destinations. She was the “joy of his life”. He was her “baby doll”, and “Love of Her Life”. A dynamic team doing everything together. He is also survived by four children: Ken (Judy), Pam (David), Donna, Phil (Kathy), Grandchildren; Great Grandchildren; two Brothers: Don (Margaret), Alvin (Pat); many nephews, and nieces. He is preceded in death by his parents: Alvin George and Donna Jean (Thompson) ; sons: Michael and James. Per his request, there is no service. His ashes are placed at the National Memorial Cemetery of Arizona, 23029 N. Cave Creek Road in Phoenix, Arizona in a beautiful above ground marble structure. Upon Ginger’s passing, her ashes will be placed by his, so they can be together for eternity. Our very special “Pete” will be missed by everyone, but all the beautiful memories will be in our hearts forever. Am sure he is entertaining the angels and God in Heaven looking down and watching over us with his great smile. Arrangements made by Bunker’s University Chapel. So sorry for your loss Phil. You are all in my prayers. Howard was truly a great man, and we will all miss him dearly. I am so sorry for your loss. I love the obituary. It was beautifully written, filled with love and a tribute to a wonderful man. You are in our thoughts and prayers. We are always up to a visit when you feel it is appropriate.